← Tiny Houses for Homeless People — an idea whose time has come. The expression, ‘Imitation is the sincerest form of flattery’ is just a polite way to say “I like what you are doing and I want to copy you . . . . AND . . . . save myself some work .” 😀 Fortunately the people out there who are helping to provide tiny and micro housing for the homeless, disabled and needy are HAPPY for you to copy their ideas in your own community, in fact, some even help facilitate it. Here are two communities that have done some great things I would like to recreate in my community. Opportunity Village Eugene is a community of 30 bungalows that provide shared-equity housing for low income people. Opportunity Village Eugene is considered ‘transitional housing’ and I would prefer to build a community that could provide permanent housing. 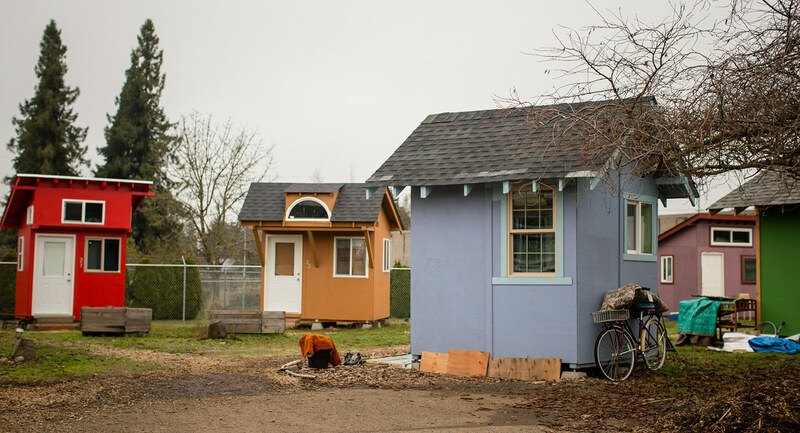 Plus the tiny houses at Opportunity Village Eugene do not have running water or electricity, and I envision housing catering to older and disabled residents who would require a bathroom INSIDE the tiny house. It will cost more but I believe it to be a necessity for long-term housing. Community First provides three different kinds of housing: RV 5th Wheels, Tiny/Micro homes from 144-180 sq ft and ‘canvas sided cottages’. At Community First all three types of housing have electricity but only the RV’s have bathrooms and running water. Both Opportunity Village Eugene and Community First have private bathrooms, showers and laundry facilities on the property. The beauty of both of these communities is that they are willing to share their knowledge of what works and what they have learned with other people who want to replicate their work. Opportunity Village Eugene even provides access to their Google Drive with copies of their application form, their Village Manual, their bylaws and quarterly financial reports. Everything you might need to replicate a similar community in your area, saving valuable time and money for those of us who are just starting out. This entry was posted in The ideas and the plans and tagged affordable housing, Contribute, Disabled People, Donate, Give Back, Give Back to Your Community, Homeless People, Homelessness, Make a Difference, Micro Homes, Pay It Forward, Tiny Houses. Bookmark the permalink. Florida is very fortunate to have you living here!